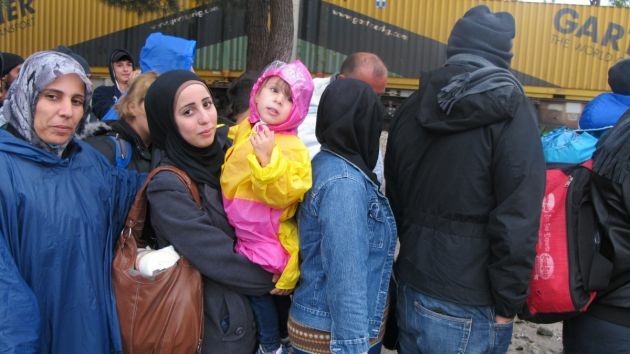 (Photo: © WCC / Marianne Ejdersten)Refugees who arrived in Greece seen in October 2015. A group of 35 bishops and church leaders from 20 countries have gathered in Munich, Germany to discuss refugees and the role of the churches in Europe and have recommended safe passage for those fleeing harm. They met during the ongoing refugee crisis seen as the worst in Europe since the Second World War. "The experience of migration and crossing of borders is known to the Church of Christ. The Holy Family were refugees; the very incarnation of Our Lord is a crossing of the border between the Human and Divine," the bishops and church leaders said. In their Oct. 29 message they warned, "Today there is evidence of a renationalization of politics". "However, the Church is both local as well as universal, and in the life of Churches we resist tendencies to work in isolation, and we affirm our deep commitment to a universal and ecumenical horizon." "As Christians we share the belief that we see in the other, the image of Christ himself (Matthew 25), and that all human beings are created in the image of God (Genesis 1. 26-27)," they said in a message after their one-day meeting on 29 October. With the latest drownings in the Aegean on Oct. 28 and 29, along with four new deaths off Spain—the International Ornganization for Migration now estimates that the total number of migrant deaths on Mediterranean sea routes to Europe have surpassed 3,329 in the first 10 months of 2015. The sea-borne death toll on the Mediterranean for all of 2014 was 3,279, according to IOM's Missing Migrants Project. "The tragedy in the Mediterranean has no end," said IOM Greece's Kelly Namia. Deaths off the Greek islands, notably Lesvos and Samos, have surged with the cold weather setting in. IOM estimates 435 men, women and children have died on the Eastern Mediterranean route linking Turkey to Greece since Oct. 6. "Sea conditions are deteriorating this time of year and the risk of shipwrecks is very high in the Channel of Sicily, where so far this year, 2,860 migrants have lost their lives. "The work carried out by the ships patrolling the area is extremely efficient, as rescuing over 1,000 people at sea in just 24 hours is a very difficult and dangerous task," said Federico Soda, Director of the IOM Coordination Office for the Mediterranean in Rome. At the Munich meeting Protestant, Anglican, Orthodox and Roman Catholic traditions in the most affected regions from most of the church families in Europe were represented. There were also representatives from ecumenical organizations and from church-based humanitarian and refugee organizations. Rev. Olav Fykse Tveit, general secretary of the World Council of Churches said, "Taking responsibility for human beings in desperate need must be done without discrimination or any criteria other than their needs. "In these times we need clear leadership based on human dignity," noted Tveit. "Chancellor Angela Merkel has demonstrated a clear and responsible leadership and created a place for people on the run." In their message the church leaders warned, "Today there is evidence of a renationalization of politics." The bishops and church leaders recommended "investing in safe passage" and assisting regions receiving the majority of refugees, "such as Greece, Italy, and other countries of transit." Bishop Heinrich Bedford-Strohm, from the Evangelical Lutheran Church in Bavaria said: "The churches' public theology must encourage those in politics who call for a common effort to give refuge to those fleeing from war and terror. "They must criticize governments which refuse to contribute their share in this common effort." Bedford-Strohm explained, "The refugee crisis can only be dealt with internationally. The Church with her local rootedness and her universal horizon through the one Lord Jesus Christ is a crucial agent in global civil society. Her witness in the world is deeply needed."